Do you remember our community garden patch? I wrote a few posts about it last year. Before we knew it, the new growing season was upon us this year. We had to make haste to get our soil ready and crops planted. 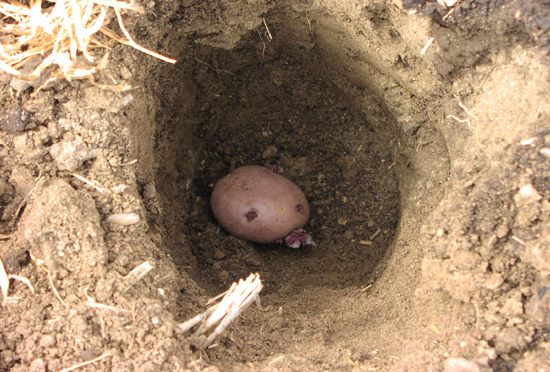 We found some potatoes we forgot to dig up last year had volunteered already. So we left half of one of our patches and just filled in some holes. The other half we planted with carrots, beets, kohlrabi. It is always tough to make decisions of what to plant when space is limited. On the second patch our two families rent we devised a new plan. Last year a terrible thing happened. Some thieves came over night and stole our watermelons. Can you believe it? 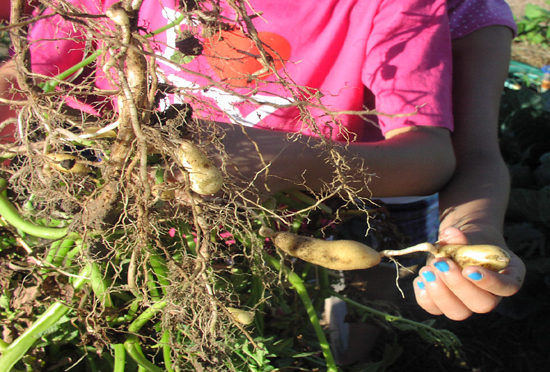 Who would do such a thing – steal crops from a community garden? The husbands came up with the idea to plant a maze to keep our watermelons safe. The two outside corners of the patch have fences now. The fence was built using some scrapwood and wire mash. We planted plants (squash) that will climb the wire. A third side of the patch has a construction made of bamboo poles and knotted sisal netting. Underneath this intrepid construction the guys planted stringbeans. Hopefully the beans will grow up the netting and make for nice green shield from that side. Along the fourth side we planted brussel sprouts again. Hopefully this will keep the thieves out so we can actually eat the watermelons this year. Keep your fingers crossed for us. The children were so disappointed. They work so hard weeding and taking care of the garden, don’t you think they deserve a treat at the end? 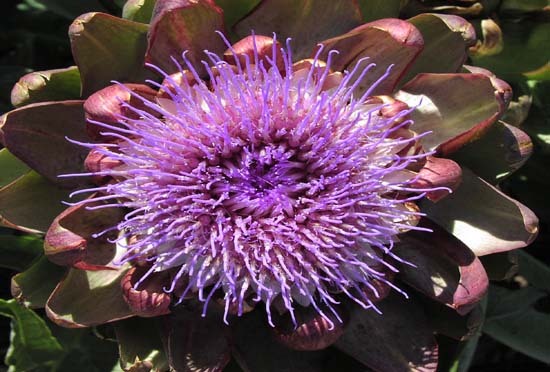 The most beautiful thing we grew in our community garden patch this year was an artichoke. We had never seen one in bloom before. The intense purplish blue color was stunning. It reminded us of some kind of sea creature – a starfish or maybe and octopus? You just can’t see such things at the grocery store. 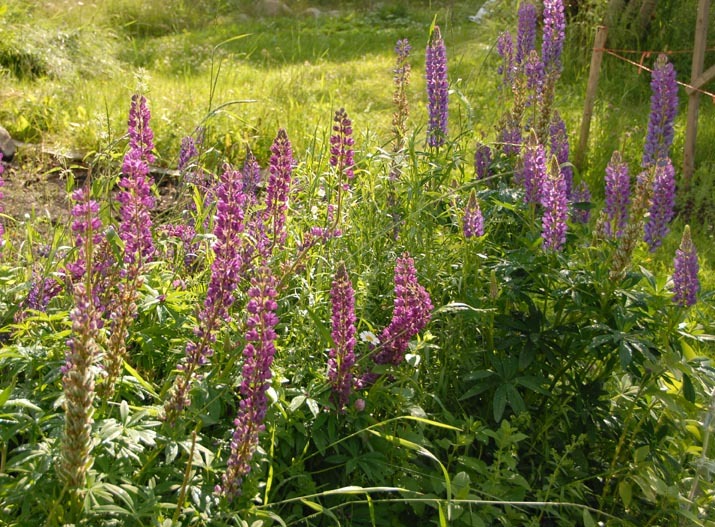 You must grow the plants like this in your garden to learn about them. 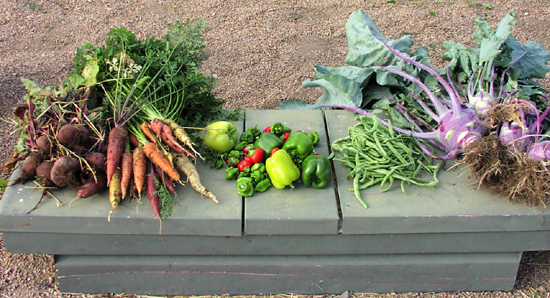 It’s been an amazing summer in our community garden patch. We have grown countless yummy veggies and even some fruit. The watermelons are getting big and the kids can’t wait to bring one home soon. I think one of the funnest things to grow in your own garden is potatoes. I know “funnest” is not a word. But the children insist that this word applies when it comes to potatoes. Have you ever grown potatoes yourself? If not you definitely must give it a try. Even if you don’t have much space they are so worth it. First you dig a hole. You lay your potatoes down in it. Cover it up with dirt. Water your garden. Soon you will find green leaves sprouting above. You never know what’s going on down under. As you watch the plants grow bigger and stronger you just know about the treasure under the soil. You wait and wait. And then one day you grab a pitchfork and go dig up your dinner. We grew red potatoes and little yellow fingerlings. The golden fingerlings were served the same night. Sorry you won’t find any picture evidence from that dinner. They disappeared too quickly. Tossed in olive oil and sprinkled with some salt and pepper we baked them in the oven. There they turned creamy and yummy. Fresh from the earth they went straight down in our tummy. I swear they were the best thing we ate this year. What’s growing in our Garden? Guessing Game Giveaway! This is our second year of owning a community garden patch. Last year we grew a Three Sister’s Garden and grew so many squashes they lasted us all winter. This year we wanted to try some different plants – plants we cannot grow in the little garden by our house because we don’t have enough space. We planted watermelon, potatoes, red and white cabbage, cauliflower, parsnips, radishes, carrots, beets and many many more..It’s amazing how much we could fit in our 15×15 feet lots. Weeding has been much easier this year since we put down some straw to keep the weeds down. It has helped immensely and I highly recommend doing it. Putting a layer of straw around the mature plants also preserves moisture so there is less watering to do! One strange thing happened in our garden this year. We found a plant in bloom that I had never seen in bloom before. So I wanted to share a picture with you and encourage you to guess what plant it is. 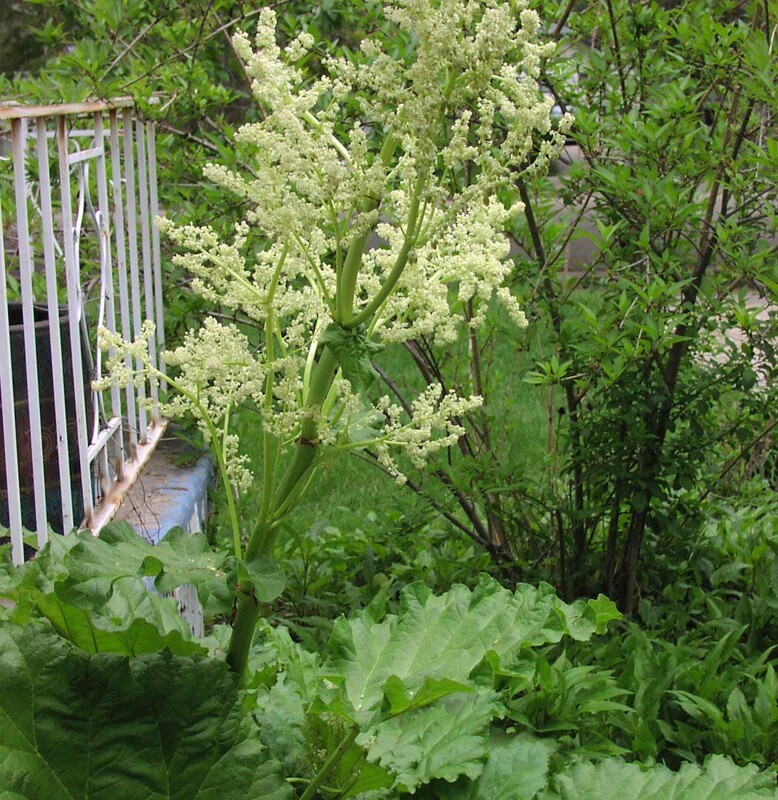 I will give you one week – until midnight next Friday – to make a guess at what this plant might be. If you guessed right you will be entered in a drawing for one of my little Miniature Dolls in the color of your choice! Don’t forget to leave your email address in the comment so I can contact you if you win! I will reveal the answer and the winner next Saturday July 15th, 2011. Don’t forget to have the kids guess too! I remember when I went to camp as a child I really enjoyed the treasure hunts where we had to bring back leaves from a certain plant. What better way to teach kids about nature! Sorry for the lateness of this announcement! THIS CONTEST IS CLOSED! Looks like 15 is Jennifer’s lucky number! She won this Giveaway for a custom miniature doll! 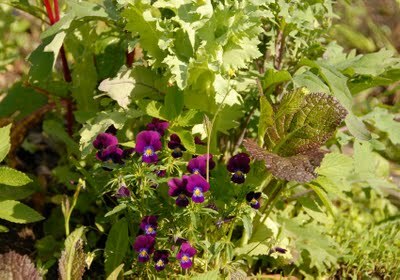 A few days ago Ulla from GermanDolls posted about community gardening for fun and food~ and I thought I would follow-up with a sharing of the community gardenin my town in B.C. Here we are at one of two 4-way stops looking at the community garden. We don’t even have traffic lights the town is so small, but we have a really great little community garden! It is located on village property and run by volunteers. Though the village is small and most people have their own garden, this community garden is for anyone who wants extra (or some) gardening land (and others, more below). 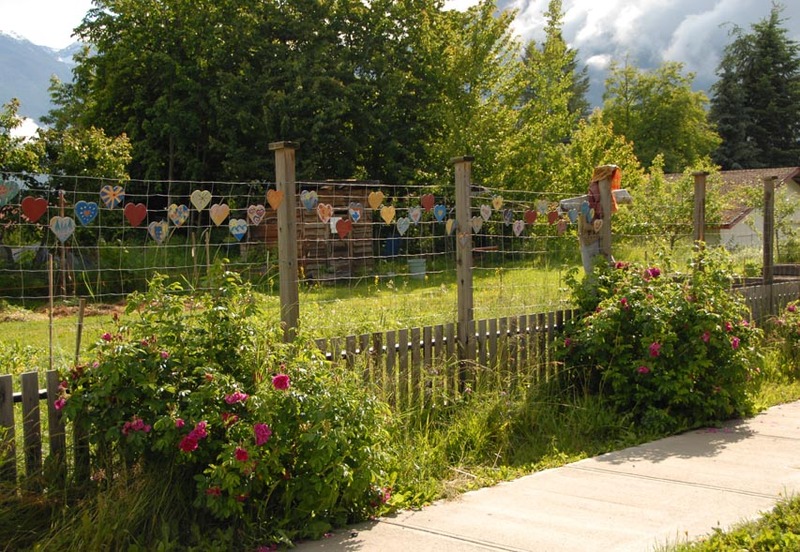 The hearts on the deer fencing were to decorate the fencing (no, not as art for the deer!) and were done by a variety of community members. Here is a fairly traditional looking garden plot. 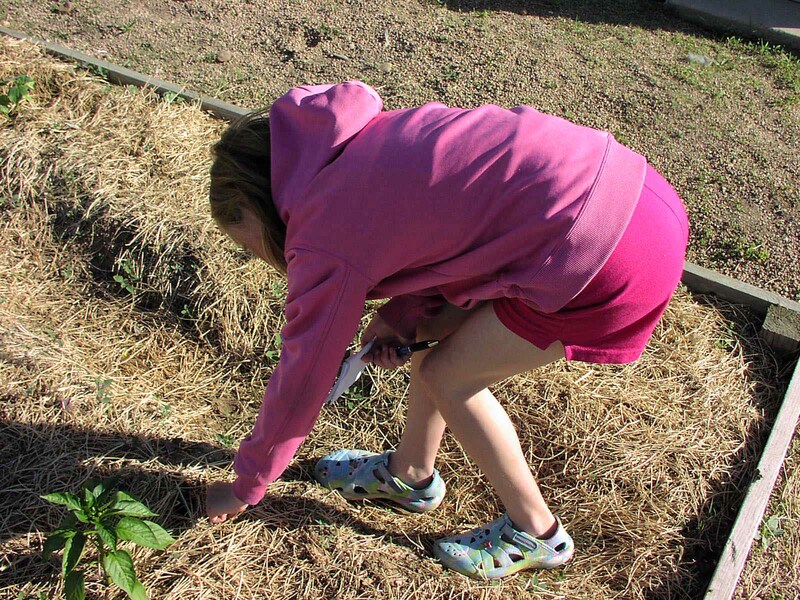 Our local school maintains sections of the garden with their classes, so students can learn to start seeds, transplant, weed & water, and harvest in the autumn. There’s not many flowers just yet as we’ve had a very rainy spring… but they are on the way. Every year an elder in our community grows a variety of flowers and then cuts them to bring them to our long-term care facility just down the road. Talk about giving to your community! Here is a ‘classic’… salad with flowers. It’s just not a proper potluck around here if someone doesn’t put edible flowers in their salad! It sure looks beautiful side by side, and there’s a whole patch of these right now. Our community garden was once just a corner lot, vacant, owned by the village. As it is one of the first things people see when they drive into town it seemed like the perfect location for a makeover. It is located close to the hospital (mostly long-term care) and school, so it is often visited. Some people grow food, some flowers and some years it is a boom and some years a little more weedy… but it belongs to the people who live here. 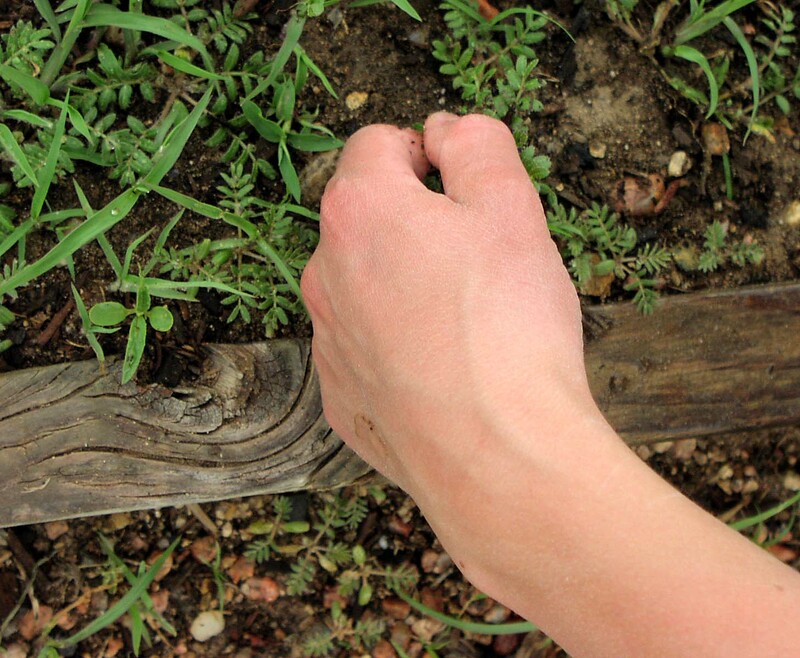 If you live in an apartment or other area and are interested in community gardening check with your local authorities, like village or city council or a search online. It’s a great way to involve your children and yourself within the community. This post is brought to you by Natalie of Woolhalla. 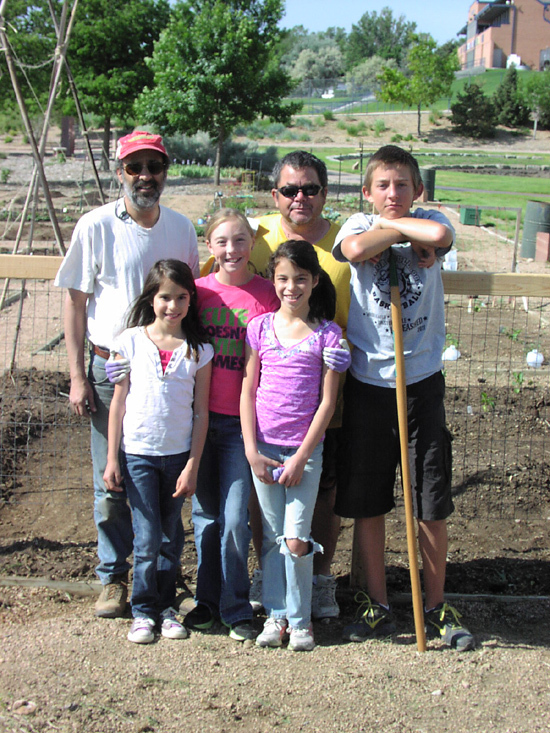 Last year our family and a family of friends became proud renters of a community garden patch. 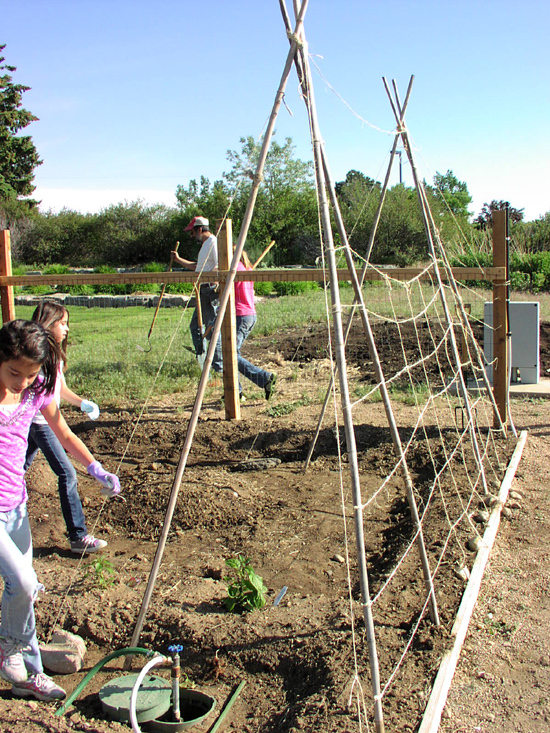 It is a 15×15 feet piece of land that is owned and managed by the City of Greeley. Patches like ours are rented out to gardeners at an annual rate of $25. 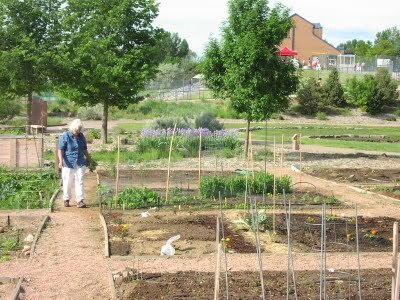 Originally the land was owned by the University of Northern Colorado, but since they had no use for it, the University donated the land to the Community Gardens project. There used to be two sites with garden lots. Our patch is located on a site that is in very close proximity to the university and in walking distance from our home. There are 22 patches on the site. The program has become so popular that a third site was added this year. The new site has even bigger patches with drip irrigation, but we’d have to drive to get there. I don’t know if you have ever visited Germany. The idea of small community gardens is not new to me. In Germany they are called Schrebergarten or Lauben and have been around since the late 19th Century. When traveling Germany by train, you may notice large green parcels of land surrounding most towns and cities. On closer inspection, you’ll see that the land is divided into many little lots, separated by fences. Many of the lots may even have a small cabin or structure on them. The original concept was invented by school principal Ernst Hausschild in 1864. Together with his friend doctor Moritz Schreber, Hauschild promoted the idea that children, especially poor city kids, should grow up closer to nature and get more exercise. During the economic crisis of the 1930s the community garden idea really took off in Germany, and many lots were given to poor families, so they could grow their own food and be saved from starvation. During WWI and WWII the little garden patches became important food sources for starving Germans. As many big cities lay in ruins after WWII garden plots with shelters gained in popularity as housing units. If you ever visit Berlin make sure to visit the large garden communities, Laubenpieper colonies, in various neighborhoods of the city. Laubenpieper is the name for the people who rent the lots. http://http//www.morgenpost.de/printarchiv/familie/article1164166/Schrebergaerten_als_Ackerland.html Am I going totally off topic here? Maybe not. 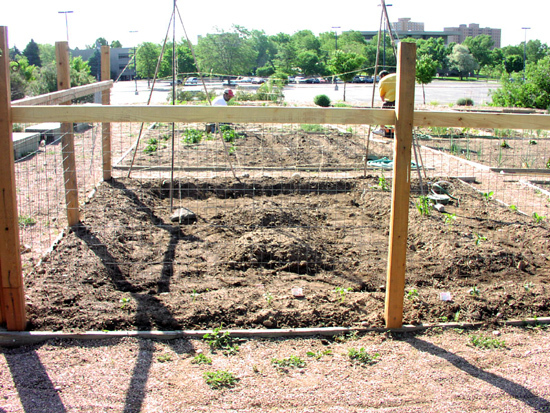 The idea behind the new community gardens project in Greeley is not so different really. With so many obese kids these days, kids who spend countless hours playing Nintendo or watching TV, having a green garden patch seems like a really good idea. 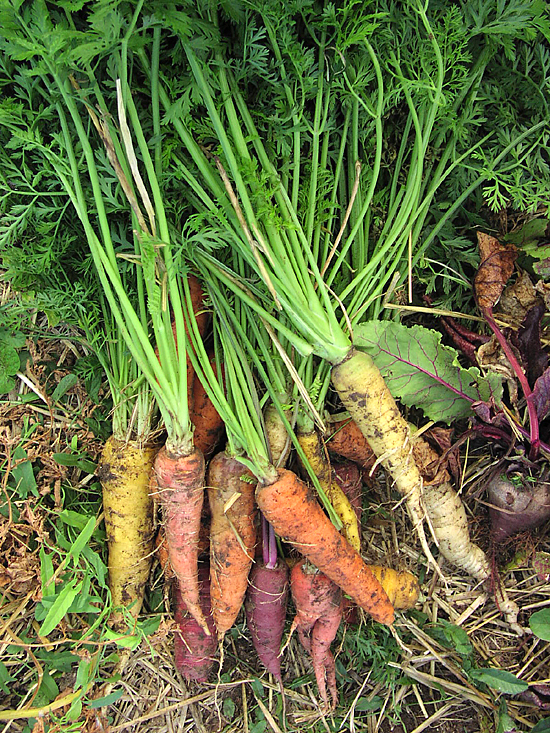 Also considering the current economic crises, interest in vegetable gardening is booming. Have you been to your local gardening center lately? They seem packed these days. 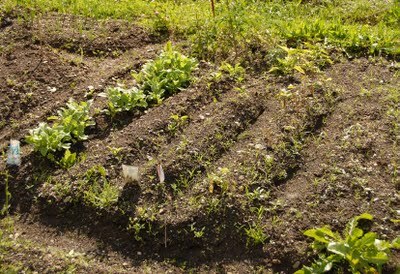 More and more people are thinking about growing their own food to save on grocery bills. Luckily our two families are not in financial distress, and we are thankful that we don’t have slave away on our small lot with empty stomachs. 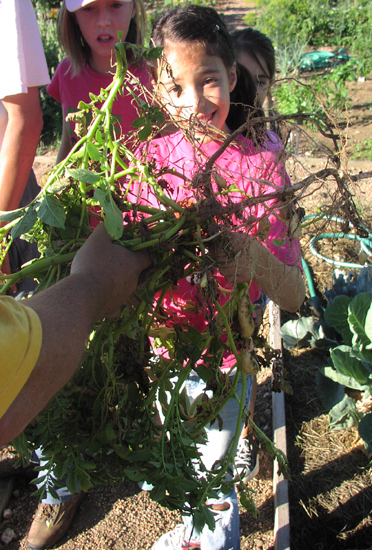 The main reason our families decided to rent a garden patch is to grow healthy organic food and teach the children about gardening in the process. We have had a small vegetable garden by the side of our house for years. We grow tomatoes, basil, herbs, squash, and salad greens in the spring and fall. But it’s not very big and we wanted to grow larger plants such as squash and watermelons we need a bigger space. Last year we grew a Three Sister’s Garden. You can read about it on my blog!